Do I have to create an online profile with Paymentus to pay my City utility bill online? No, you can make a one-time payment through Paymentus without an online profile. You will need to know your utility account number and the phone number registered to your account. Of course, you can still make your payment in person, at a drop box, through the mail, or through other existing methods. Does the online payment site use third-party cookies? Yes, the Paymentus payment site requires third-party cookies be enabled for their site. When cookies are disabled you are unable to make payments or access bill information online, and you will see a message that you must have third-party cookies enabled in your web browser. What are the benefits of setting up an online profile with Paymentus? You will receive an email notification to let you know when your bill is ready and when a payment has been received. What information do I need to set up my online profile with Paymentus? You will need your email address and your utility account number. On the Paymentus Registration page, you will create a profile using your email address and a password. Once logged on to the Paymentus Customer Portal, associate your utility account number with your profile using the Accounts > Add Account option. 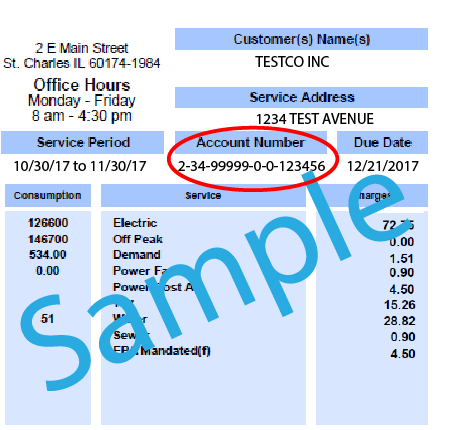 You can get your account number from a copy of your bill or by calling our Utility Billing Office at 630.377.4426.